We’re here to make sure you enjoy an outstanding camping experience. To help you make the most of your stay, we’ve compiled a list of frequently asked questions about camping in Enderby as well as our booking policies. If you don’t see your question, please contact us! 1. How far in advance can I reserve my site? 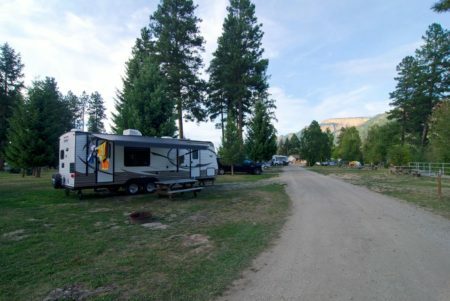 Since Riverside RV Park is a private Enderby BC camping destination that’s open year-round, you’re welcome to book your site up to one year in advance. 2. Do I need to give a deposit? Yes. At the time of booking, a 50% deposit is required. If your plans change and you give us more than seven days’ notice (for less than 10 sites), we’ll refund your deposit less a 10% administration fee. If your party books less than 10 sites, notify us of your cancellation in seven or more days, and we’ll return your deposit, save for a 10% administration fee. For large bookings of more than 10 sites, you must provide 30 days’ notice to receive your deposit less the 10% admin fee. 4. What’s the best time of year to float on the Shuswap River? 5. Can you host large family reunions, weddings and festivals? Absolutely! With the Lion’s Gazebo right next door and available to rent, we have all the space and amenities to make your event a success. Our Enderby BC camping destination is now home to several music and sports festivals as well as annual family gatherings and beautiful weddings. Contact us to learn more about availability and ways we can help bring your event together! 6. Is this a family campground? Yes. Camping is a special way for families to spend time together outdoors, and our RV park is proud to offer a safe, family-friendly environment with so many things to do for campers of all ages. 7. What are some things to do in Enderby? When you’re camping in Enderby BC, you won’t have to worry about finding things to do. The river, Riverwalk, playground and ball fields are just footsteps away. Outside the RV park, we’ve got a whole list of attractions you won’t want to miss, including the The Starlight Drive-in and the Enderby Cliffs!